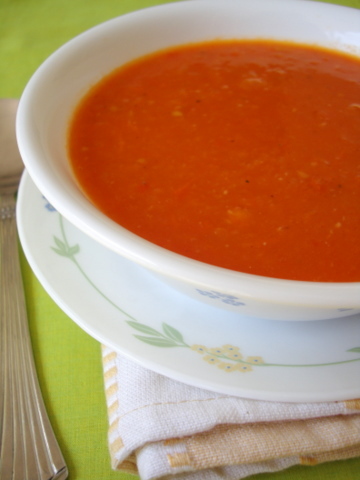 A vibrant, hearty, soothing, chunky tomato soup to brighten up the rainy season! The key to a delicious tomato soup is in roasting the tomatoes. Use herbs of your choice. My favorite herb is fresh coriander leaves and I like a chunky tomato soup. 1 Heat oil and butter (optional) in a vessel, add the cinnamon, clove, onions and garlic and saute for 3 mts. Cool and blend to a paste. 2 Add the crushed tomato to the onion paste and saute for a mt. Add three cups of water, coriander leaves or dried herbs, nutmeg pwd, black pepper pwd and jaggery and let it simmer on low-medium heat for 25-30 mts or till it thickens slightly. 3Keep stirring once in a while while the soup is simmering. [You can blend the cooled tomato soup and simmer for 2 mts for a smooth soup]. I like the soup chunky hence, I have not blended the tomatoes. 4 Serve hot with croutons or garnish with fresh cream. On a baking tray, place halved tomatoes, sprinkle herbs of your choice, 2-3 crushed garlic, drizzle olive oil over them and broil for 15 mts. Peel the tomatoes and lightly crush them. OR Prick the tomato with a fork and hold it over the fire and roast it all over till charred. Cool, peel and crush. and croutons means fried bread crumbs in oil??? Lightly apply butter to whole wheat bread and toast in the oven till crisp. Cut them into small squares and serve as croutons instead of deep frying. There’s nothing better than a bowl of such yummy home made soup and some great bread! This is such a winner! It has a very different taste and so delicious. Thank you so much. A very hearty soup Sailu, it will make a great meal with a slice of bread. I found this under vegan recipes, how can it be when u r adding butter????? Anon, butter is an optional ingredient as mentioned above in the recipe. What a great recipe! Just loved it! I did skip the tomato roasting step and bought cans of fire roasted tomatoes. So hearty yet so much healthier than the cream laden versions we find in restaurants.